2xPCR TaqNova-RED is a concentrated, ready-to-use PCR master mix with TaqNova polymerase, which facilitates an easy and rapid PCR reaction set up. The 2x PCR TaqNova-RED solution contains a reaction buffer, magnesium chloride, dNTPs and a thermostable Taq DNA polymerase. The 2x PCR TaqNova-RED is recommended for multiplex PCR assays. 2x PCR TaqNovaHS concentrated, ready-to-use PCR master mix with TaqNovaHS (Hot-Start) polymerase, which facilitates an easy and rapid PCR reaction set-up; without red dye. The 2x PCR TaqNovaHS solution contains a reaction buffer, magnesium chloride, dNTPs and a thermostable TaqNovaHS DNA polymerase and a highly specific monoclonal antibody, which acts as inhibitor of the polymerization activity. TaqNova DNA Polymerase suited to a wide range of applications, fast and very efficient; universal and easy-to-use; half-life of the enzyme is 45 minutes at 95°C; shows 5’→3’ exonuclease activity; does not have 3’→5’ exonuclease activity; adds A on the 3’ ends. 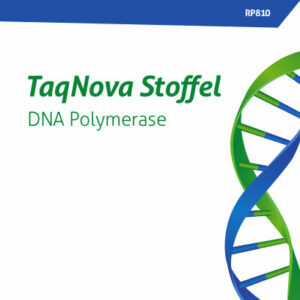 TaqNova Stoffel DNA Polymerase is an universal and easy-to-use DNA polymerase, that works rapidly and effectively in various PCR conditions. The enzyme catalyses DNA synthesis in a 5’→3’ directions, it does not show a 3’→5’ and 5’→3’ exonuclease activity. The thermostable TaqNova-RED DNA Polymerase catalyzes DNA synthesis in 5’→ 3’ direction, shows no 3’→ 5’ exonuclease activity, but demonstrates 5’→ 3’ exonuclease activity. TaqNovaGC DNA Polymerase ideal for amplification on GC-rich templates; ideal for problematic templates, which fail with standard Taq DNA polymerases. The TaqNovaGC DNA polymerase is a universal DNA polymerase which works rapidly and effectively in various PCR conditions.